6.1 Insteon/Universal Devices ISY-99i controller. We dug out an entire new basement under our existing rancher style house that originally had a 3 foot crawl space. We had a lot of planning to do before we got going and in addition to figuring out the floor plan layout, I took on the responsibility for doing ALL the low voltage wiring. I wanted a dedicated closet for all the computer, security, and AV equipment so I made sure that got into the floor plans. I also had to make sure I had all the tools, wire and plan for doing the LV work ready to go when needed. I did not want to interfere with the other sub-trades and schedule. Here are an overview of my plans for the basement, AV, Network and home control. Then onto the actual build construction. We dug in a full basement , essentially doubling the size of our house! Here is floor plan for the new basement. I also created a 3D Google Sketchup model so I could preview what we were going to build. Based on this model, we made some changes to room sizes because they did not feel right in the 3D model. Once we finished the basement, it was kind-of spooky walking down the stairs and getting that "I have been here before" feeling. Go and get SketchUp, it is free and really helps get a feel for what you are about to build. all cables are home run back to common media closet for inter-connections as needed. It has to have great sounding equipment, including PSB speakers and a new Onkyo top of line receiver. is the Main Family room in the basement with 2 new front floor speakers for music but also has full wiring for 9 other surround system speakers. The front two floor speakers and center channel speak will be the only speakers that will not be mounted in the wall. All wall/ceiling speaker wiring will have the wires left hidden in the walls to be recovered after drywall is completed. is the exercise room with separate volume control for playing tunes. The speakers will be ceiling mounted 2 feet left and right of the wall mounted TV. will be for a set of speakers on the deck or in the main upstairs living room so both must be wired and selectable from the Media closet. I thought about a whole home audio system but really could not see the need/justification for it. The 3 zones provided by my new Onkyo NR5008 was enough. is the Main Family room in the basement with a new Flat screen TV mounted on the front wall. It will have 2 HDMI 1.4 cables run to a recessed outlet box that is behind the TV. A lower outlet box is placed at normal electrical outlet box height to provide flexibility in routing for the lower wiring; HDMI and audio cable and a conduit runs between the high and low outlets. can be set to either the game room or the exercise room fed with a composite feed. I ran two RG-6 coax cables to most rooms in the house to provide OTA and a shared multiplexed video feed. We use ShawDirect as our satellite cable TV provider and it provides 4 feeds from one satellite so I have to share one of these feeds among all non-heavily used TVs. 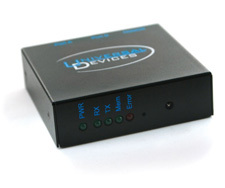 the remaining ShawDirect HD digital converter will be fed into a video multiplexer that will be merged with the DVR signal, the OTA signal and a BlueRay-DVD player signal. This took a lot of thinking. I lurked on the digitalhome.ca forum for Home Theatre Design, Construction & setup, and the www.avsforums.com website to see pictures and advice on what others have done. I looked at all the end use needs and decided I needed a closet about 1 meter by 1 meter in size to house all the controllers and AV equipment. One side borders on the family room with a opening into that room covered by a smoked glass door. The opening is 18" by 48" to show the front sides of my AV equipment. The back of the AV equipment is open to the inside of the closet to allow/hide whatever messy connections that are needed. W hat "rack" did I use to hold all the equipment? I decided to keep it simple and simply mount 2 heavy duty shelving hangers with shelves cut from 5/8" MDF to fit the spacing perfectly. This was cheaper than a network rack and it was custom fit to the room. I got the best of both worlds. Thanks go to this post on the avsforums.com site for the inspiration. See over to the left for a view of it without the shelves in place yet (they are all stacked on the bottom shelf). Ventilation - from experience, I also made sure I had a low-flow bathroom fan put into the closet to keep the air moving. I put all the wiring and equipment for the security, broadband coax, telephone, and firewall into four in-wall structured media cabinets to keep it out of the way and nice and neat. The equipment for the AV stereo, DVR and video security computer equipment will be located on a equipment shelf rack in the closet. The OpenOffice file for this layout is attached in the attachments section at the bottom of this page. I did not want to skimp here, especially on the games room (drums, keyboard and guitars, TV and Wii). WhisperClips from Soundproofing Company, Inc.
For the pot lights, I used homemade 3/4" MDF pot light backer boxes mounted with RSIC-DC04 sound isolation clips to fully enclose all the pot lights that were used. Click on the pic to the right to see a close-up. The family room and spare room ceilings also got resilient channel and WhisperClips with QuietRock 525 as well as pot light backer boxes mounted with clips. The only weak spot is the double french doors into the games room. I used solid wood doors and double pane glass. Whatcha gonna do - its gotta look good. Once I had a plan for all the outlet drops that I wanted, I estimated the wire lengths I would need. TIP: Buy extra of all wire types, especially Cat5 cable to allow for installing more connections than what is needed. Cat5 is cheap and can be used for many different end-use needs such as extra control, extra telephone, or network connections, or even power if needed. The detailed execution of this wiring is on its own page. This is a special item that allows me to have a high efficiency power supply located in my media closet and run a low voltage distribution bus around my house. It supplies places that usually have "wall wart" little black 120AC to 12 volt DC supplies plugged in. I will simply have an outlet that has two twist on speaker terminal posts that can be used to supply my WAPs, my telephones, LED lighting, smoke and CO detectors. This also took a bit of research; I knew I wanted to control all my lights and various other items around my house like HVAC, and watering systems. I started by looking at off-the-shelf systems like Lutron, Control 4 and others. They are slick but pricey and hard to DIY since I was doing it myself. They also all required changes to the electrical plan and thus working closely with my electrician. This was a RISK item I was not sure I could pull off. Oh ya, did I mention pricey $$$. Program groups of lights and lighting levels into "scenes"
Go visit Insteon.net or Universal Devices and buy everything you need from www.aartech.ca. I can't say enough about this little device, plus the online support is fantastic. I want to have a valence bulkhead surrounding the ceiling in the family room to allow for RGB LED strip lighting for ambient ceiling lighting while watching movies or TV. The valence will not be anything fancy, just somewhere to hide the LED strings. I ran multiple 12V wires up into this valence at the back of the room to be able to power the LED strips. I have yet to buy the LED lighting. Full house security system: Elk-M1 Gold. I ran 2 pair security wire to as many locations that I could get to; essentially all downstairs locations including water sensors and smoke detectors. For the upstairs - I settled on wireless contacts via a GE Crystal wireless interface to the Elk system. These are much more expensive but I could not easily get the wiring into the upstairs window locations. Because we re-did our upstairs kitchen and front door, I was able to get those locations hardwired. The Elk M1 is a DIY's UL listed super system. It will do anything you want in a security system, including interfacing with my ISY-99i home controller, 2-way voice/listen-in, web access, iPod and Android apps, as well as secure web access.